Buy Three Cheers for Women! Use Rewards for Three Cheers for Women! Nobody deserves a shout-out more than women – and who better to give it than comic-strip queen Marcia Williams? 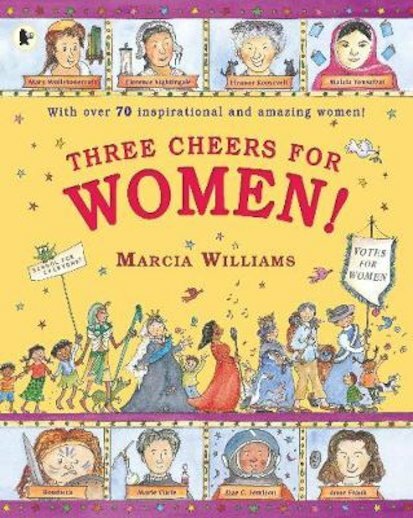 From writers and warriors to astronauts and activists, this book celebrates wonderful women in facts, jokes, quotes and quirky cartoon strips. Cleopatra, Boudicca, Joan of Arc, Elizabeth I, Mary Wollstonecraft and Jane Austen. Florence Nightingale, Marie Curie, Eleanor Roosevelt, Amelia Earhart and Frida Kahl. Wangari Maathai, Mae C. Jemison, Cathy Freeman and Malala Yousafzai. Hip hip hurray! Three cheers for them all!